Nestled in the Cibao Valley is Santiago de los Caballeros, the second largest city in the Dominican Republic. It has a population of about 550,000 people. Located only two hours north-west of Santo Domingo, a day trip or weekend trip to Santiago is worthwhile. Smaller and more manageable than Santo Domingo, Santiago offers an array of restaurants, nightlife, and real Dominican flavor. Here is my short list for a day trip to Santiago. When in Santiago, do as the Santiagueros do. Start out the day on Calle del Sol before the mid-day heat hits. This historic part of the city boasts cheap shopping along the old streets. Here you can find old churches, crumbling parks, and accomplish your clothes and souvenir shopping. I am personally all about Yaroas. What is a Yaroa, you might ask? Not only is it a famous dish in Santiago but it is delicious. As one of the few vegetarians in the Dominican Republic, I always surprise the chef by asking for one without meat (sin carne) but it is still tasty and filling. A typical yaroa will contain some type of meat (beef or chicken), papas (potatos), maduros (mashed sweet plantain), sauce, and loads of cheese. You can buy yaroa at the base of the Monument, but I also personally recommend Barriga Light, in Los Jardines, where you can get a MASSIVE yaroa. Only once have I managed to eat an entire yaroa from Barriga Light in one sitting. I’m not proud. Hint: They deliver. This is dangerous. 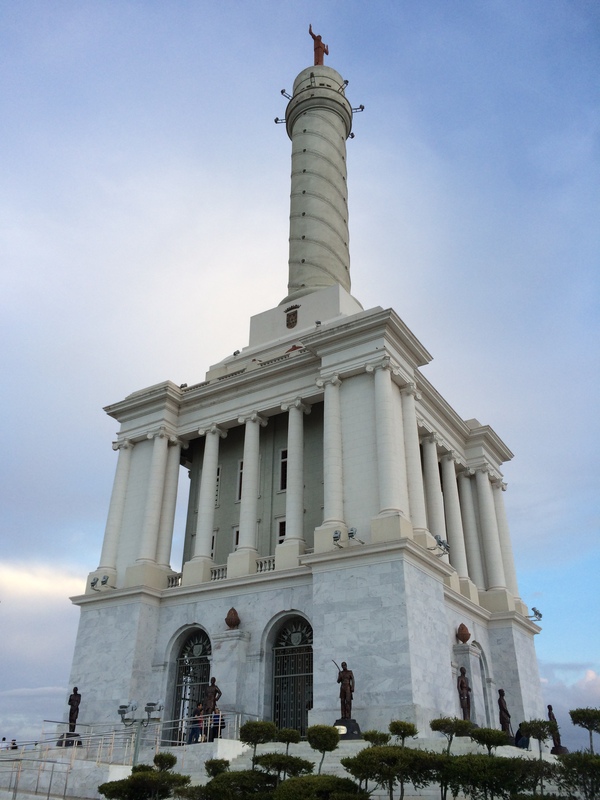 Walk off your Yaroa lunch by heading up the hill to El Monumento de los Heroes de la Restoracion. Sitting atop a huge hill in the center of Santiago, the Monemento looks over the Cibao Valley. During the day you can enjoy the views of the mountains in the distance and see all of Santiago. At night, the city’s lights are lit and you can enjoy the breezes with other Santiagueros who come to enjoy the night air with their friends and families. Surrounding the Monument are a number of restaurants where you can [eat a Yaroa,] enjoy the view of the Monument, including Puerto del Sol, with a large patio and loud music. The classic hang-out spot Square One is right by the gates of the University PUCMM along Estrella Sadhala. This popular burger-and-shake spot also offers a wide variety of salads, sandwiches and pasta dishes. Usually the restaurant is full of families, students, or couples on dates. When all else fails, put on your heels and head to Bella Terra Mall. This mall has everything you might need for a relaxing afternoon or evening. Take a class at the dance studio, see a movie or eat in the food court, or grab a drink at one of the bars. On the ground level outside, there is Migas Drinks and also MojiBar, both known for their Mojitos. Some nights they have half-price drinks. Additionally, another bar is located on the fourth floor with a fancy lounge. The mall has ample parking and is a great place to see and be seen. Finish out your night by visiting the bars in Los Jardines. A Saturday night could include bar-hopping between Cay Bar, which plays rock music, Queen Elizabeth, which has a quieter, more diverse crowd, or a number of other spots. What else should visitors do in Santiago? Leave a comment. Looks like an awesome collection of things to do! Love the photos, and that milkshake definitely looks delicious! Thanks so much for sharing! Thanks for stopping by Jordan! I am glad you liked the post!